Will track this as we get closer. Be thinking of a dawn launch, 6:10a by then…. 11a profile, the Goat wave vs….. 3p profile which is sloppier. so factor in the slower assembly due to winds. I plan a 7a or so launch. Task: Goat, St. Helena, down the Napa valley, Diablo wave, Los Vaqueros, Fremont, Santa Cruz & return. Allowing 6 hours. FNX launched at 0735 PDT. The surface wind was 24 K from the north. Well, the flight was an incredible experience. It feels like it kinda didn’t happen, like I dreamed the whole thing. I’m still post-processing…. and his earlier flight under the Class B airspace March 3, 2011. In the days leading up to Saturday’s flight, we talked about the weather setup, principally the NNE winds. We both noted how the small incremental change in direction from say, 010 to 030 makes a big difference in the strength and abundance of wavelets. While Ramy’s 2012 flight was from Byron, right next door to Mt. Diablo, I wanted to do the flight from Williams and then make it back. The setup arrived as noted earlier in this thread. My co-pilot Johannes Zadrozny, the son of a work colleague from many years ago, has his private glider & power license and he’d flown with me ten years ago at WSC in the Duo. Climbed again to 17.9K on the Mayacamas, then ran south along the wave off of the ridges on the east side of the Napa Valley down to almost Napa. I’d done this twice before, once with Gunard, and separately Pat Alford, both on NE winds. Since it’s so infrequent between times I do this, it took me a couple false starts to remember to follow the river and/or highway on my old Garmin as you can’t tell from high up how you are tracking relative to the ridge line. The ridge line are like wrinkles, not like running the Sierra. The lift ended east of Napa airport, then we had sustained sink crossing the Delta, on the order of 3-5 knots!!! I’d been in touch with Ramy before launch, and we’d said we’d meet up in the Diablo wave. Well, two unpowered aircraft 100+ miles apart meeting up at a point in space at the same time seemed unlikely, but as it worked out we meet up in the Diablo wave at 10a, with only 300 ft altitude difference! The Diablo wave is often small in area and weak, 1-2 knots, but this time it was broader, perhaps a mile square and 3-4 knots lift. It’s now 10:30a, and Ramy declares he’s moving out to the Santa Cruz wave. While I follow for about 20 seconds, I break off realizing that with the strong winds, it will be less likely we can make it back in time. My target was to be at St. Helena by 2p. We continue with the plan to overfly San Francisco, and hopefully catch the Mt. Tam wave that has been confirmed only once by Ramy’s earlier flight. No one else has confirmed this “Loch Ness” wave actually exists…. Over San Francisco I have to decide whether to turn back or go for the Tam wave. Because of the Class B air under us at 10K, we have to keep enough clearance to get back to the Diablo wave, or press on. It’s another 6-7 miles to the Tam wave, and it looks so close I decide to go for it, vaguely knowing that Novato, Petaluma and San Rafael are safety airports. Well, right over the coastline downwind of Tam….. there is only zero-1 knot. I call Ramy, now down near Santa Cruz, asking for more detail on the whereabouts of the wave. He says over the coastline, but maybe further out over the ocean. Well, if you are in a glider, with dim prospects for lift, no ability to retrace your path, then look out over the Pacific, and are told to “go further out”, it feels like you are near the end of the world. Thoughts float through my head like, “well, maybe we could land on the back of a whale!”. My eye is drawn to the Farallones, but…. don’t think about it…. But over downtown Novato, at 7.5K, we hit 3-4 knots of smooth lift up to 12.5K. OMG, un- f***ing believable!!!!! 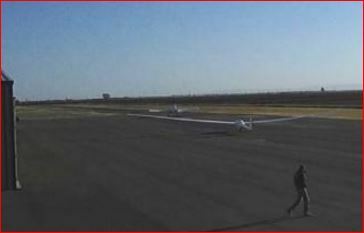 We continue north to the low hill East of the Petaluma airport, and another climb of a thousand feet or so. Now Calistoga & St. Helena look possible. 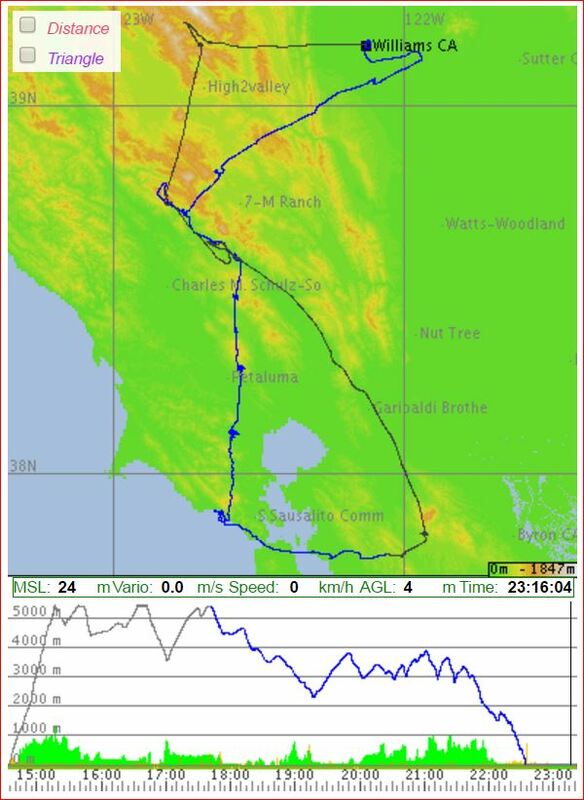 Over the ridges west of St. Helena, another climb, and now we just hop across to Calistoga and climb up to 14K, in easy glide to Williams. YIPEE!! We were then tempted by rotor clouds along Hiway-101 well past Ukiah, and started to go a few miles toward them when I said,”Y’know, we’ve achieved a miracle flight, let’s not mess it up by landing out when we have Williams in hand”. So we zoom back to Williams and hit strong thermals in the valley that go up to 6K. A bit bouncy landing (remember to always do a long final just like for runway 16) and we end an 8 hour flight landing back at WSC! As I’ve commented for awhile, the wave locations and strength really don’t change much and were here for thousands of years before us and will be here for thousands of years after us. Therefore, by confirming location and the weather setup for these by flying them, we can eventually string together wave locations for spot to spot wave cross country flights as a common occurrence. This would not be at all possible without Charlie Hayes helping to assemble and tow, and of course, Rex & Noelle to support and co-plan. Thank you so much!! Last edited by Kempton; 05-02-2016 at 05:24 PM. Why do some people fly?